Today CHF stays neutral for news but USD is about to be effected by the release of Building Permits and CPI data and Crude Oil Inventories followed by FOMC publishing the commencing. Yesterday the price touched 0.9895 creating a short term sell opportunity but it bounced back to 0.9900 today. Now the trend is hanging in 0.98600 and 0.98900 area and has not determined its bullish or bearish tendency but the support levels are at 1.9845 and 0.9800 with resistance of 0.9895 and 0.9950. 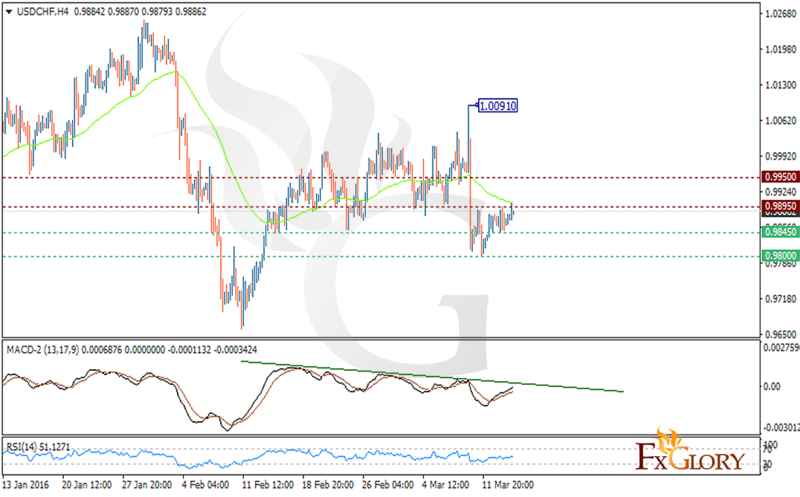 If the price breaks the support at 0.9800, it may fall and drop to 0.9660 and on the upside, if the price touches 1.0091 it will change the resistance zone to 1.0225 and 1.0327. While USDCHF is being supported by the 55 weeks EMA, it is better to stay neutral at this moment. If traders insist on USDCHF, they can open their long position when the price reached 0.9800 or go short when the price reached 0.9891 and 0.9903 area.